Parang Mountains are an important objective for lovers of ski touring, and although it has an easily passable main ridge, it is still difficult and long to cover. 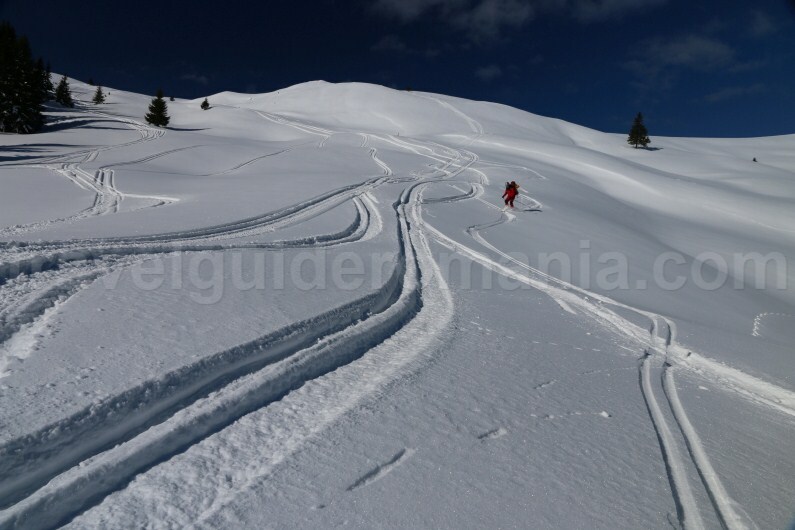 Ski touring is a form of off-track skiing that allows covering rough terrain due to some adjustments of the traditional ski equipment. 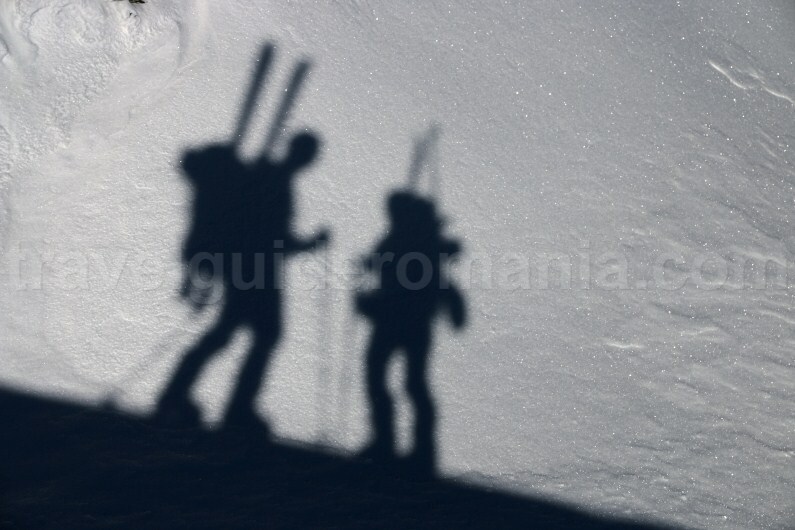 Oftentimes ski touring is combined with ski – mountaineering, skiers having to use the ice picks, snowshoe crampons, and safety measures (cords, anchors). 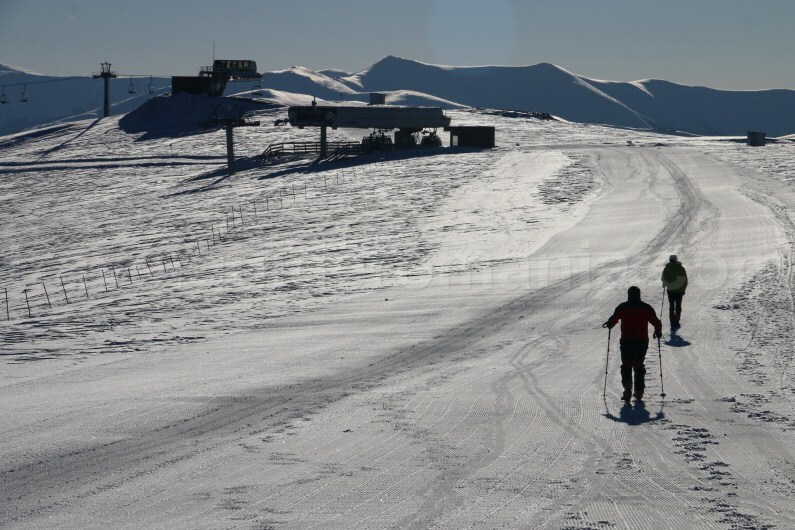 – The ascent is done on skis by attaching anti-slipping leather (sealskin) on the soles of the skis. The skis’ bindings are different than the ones for skiing on slopes, because it allows the foot to move freely. You can attach snowshoes crampons on the skis, thus allowing coverage on the ice. 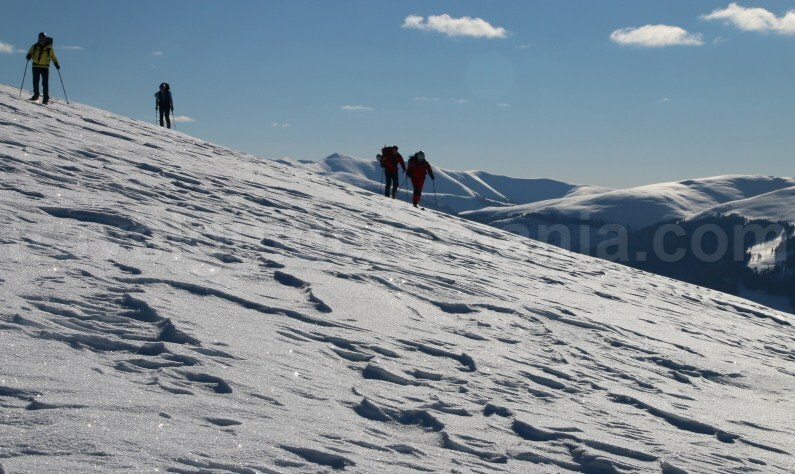 In areas with scarps that are too steep (both for ascent and descent), you will have to take off your skis (put them in your rucksack) and carry on by foot in crampons and with an ice pick. – The ski boots are much more flexible and lighter. They have a lock system for descents. 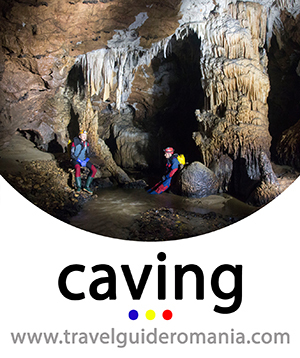 – Descending is made by sliding on skis without the sealskin. 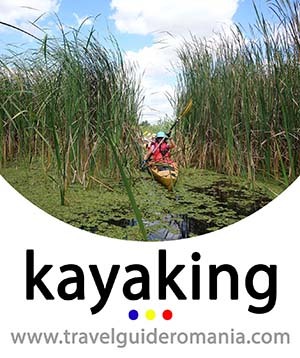 If the terrain has gain and the track is too long, you can leave the sealskin attached throughout the trip. 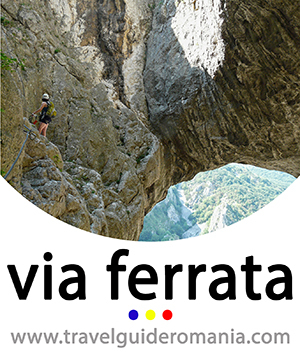 – It is advisable that the trekking poles to be adjustable by height. 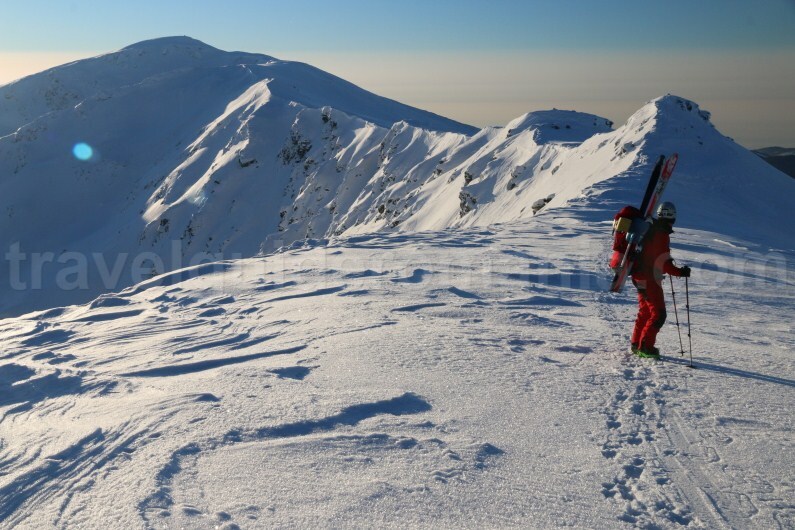 In order to practice ski touring, you need a minimum level of expertise in alpine skiing. Unlike alpine skiing, the state of the snow and adapting to it and the terrain are two extremely important aspects when it comes to ski touring. 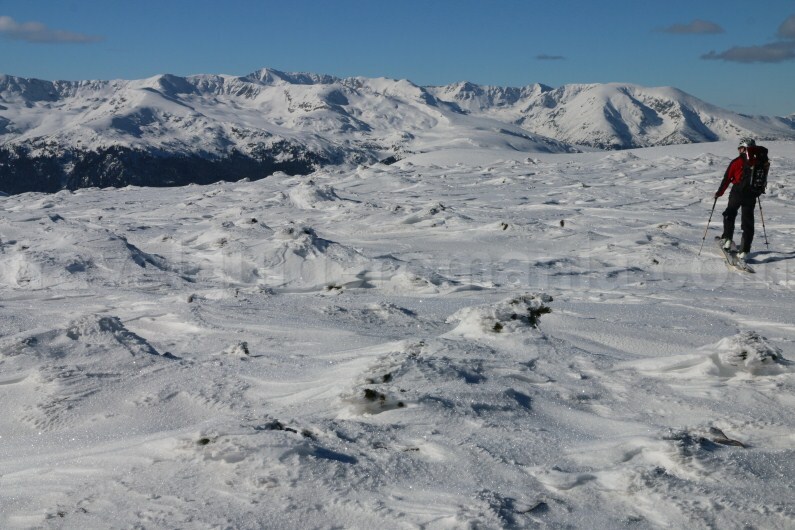 If the snow on the slope is pressed, the snow off-piste can be corn, crust, or powder snow. 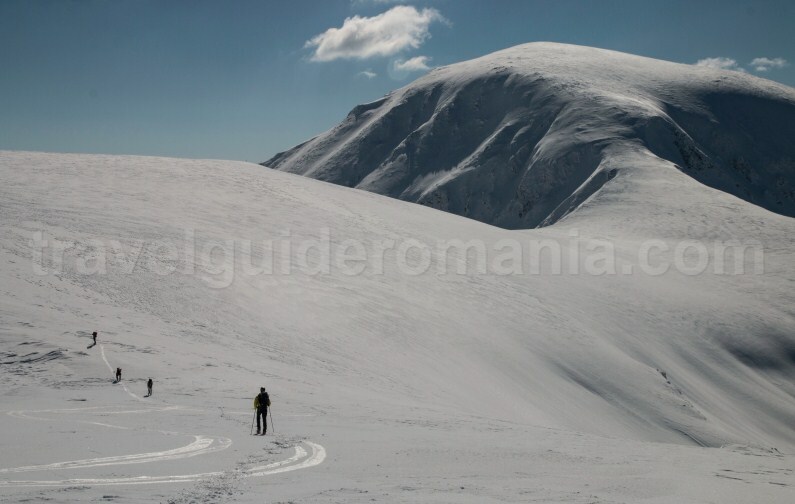 To cover the Parang Mountains Ridge on skis, Travel Guide Romania presents you with a route that starts from Vidra Ski Resort (Transalpina) to Piatra Taiata Peak. 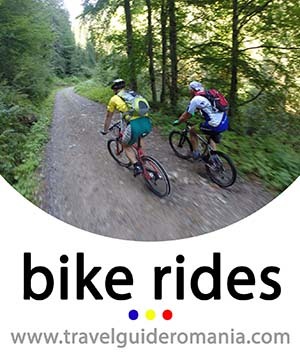 The route can be adjusted to a longer period of time or longer distance. Watch out! 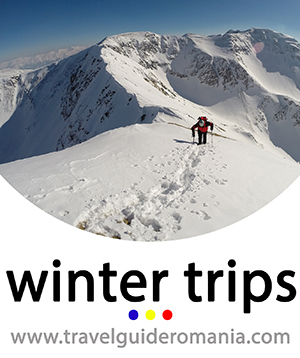 This route can be covered only by those with expertise in ski touring and mountaineering. 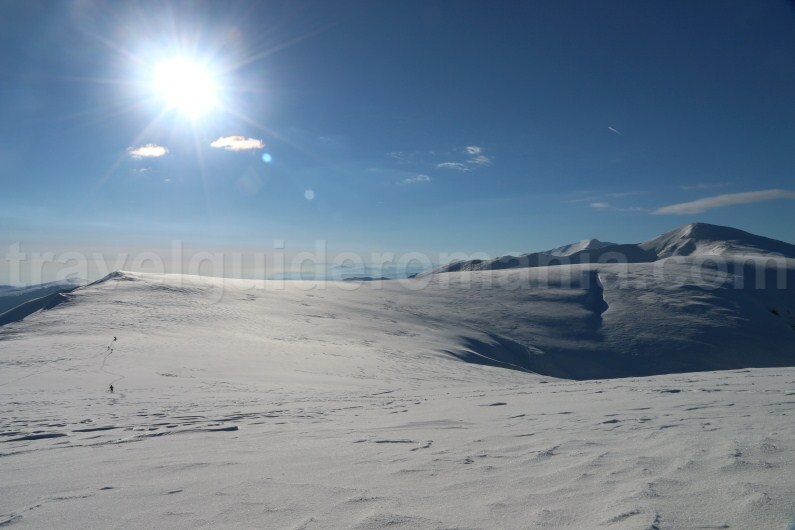 For your safety it is advisable to have knowledge on snow, avalanches, and meteorology. 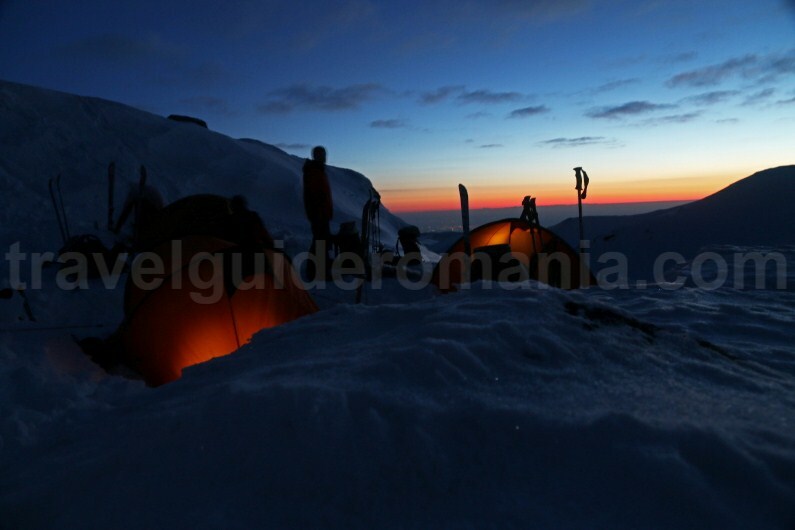 – a four-season tent, winter sleeping bag (fleece is recommended, minimum comfort -10°C), iso mat. – base layers, jacket and trousers against wind/rain/snow, fleece waistcoat, two pairs of gloves. It’s good to also have a GPS device. In case of bad weather and low visibility it will help you find your way back. Try to have a rucksack as light and compact as possible. If you don’t have skis for ski touring, you can replace them with snow racquets. Recommended period: February – March. The weather is stable and the days are longer. Day 1 – trip to the ski resort. 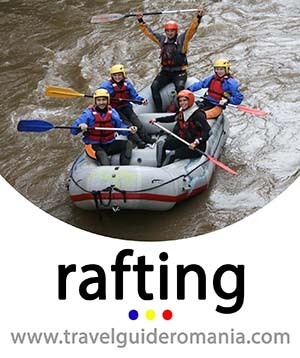 You can spend the night only at Groapa Seaca cabin, Obarsia Lotrului cabin, Petrosani City, or Voineasa Resort. 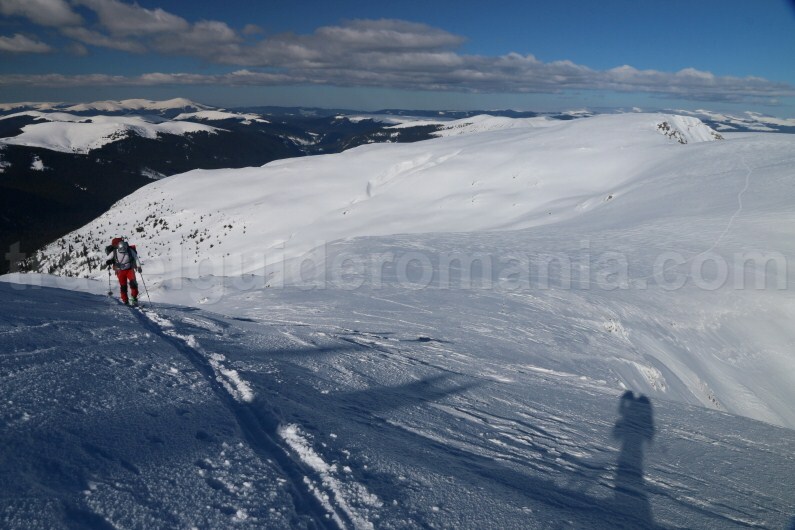 Day 2 – set out on the first chair lift, continue on skis until Piatra Taiata Peak (approximately 8 hours/15 km/900 m elevation gain). 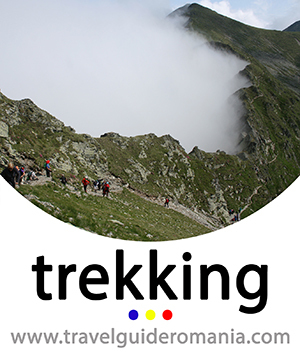 Day 3 – Retreat via Coasta lui Rusu to Huluzul Saddle, descend to Transalpina road (12 km) and then on DN7A. 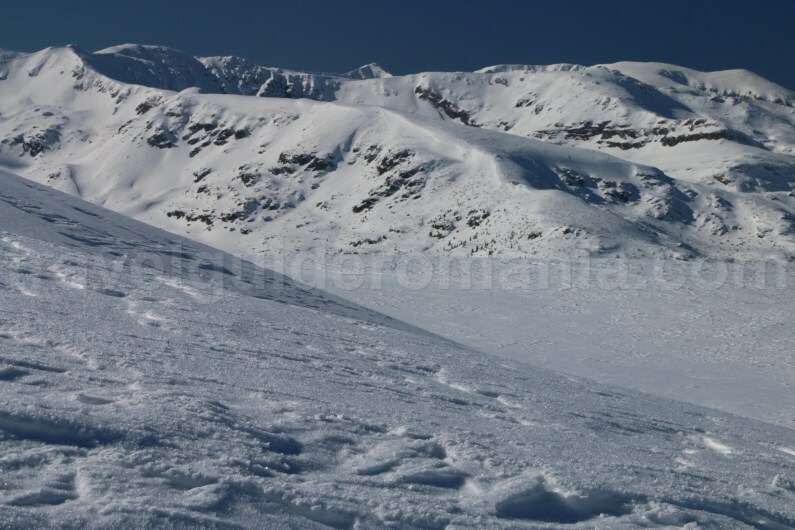 Access to the ski area is only possible by car or taxi from Petrosani. Unfortunately there is no public transportation during winter. For this route, the car can be left in the parking lot of the ski area and you can take it back when you descend the ridge. 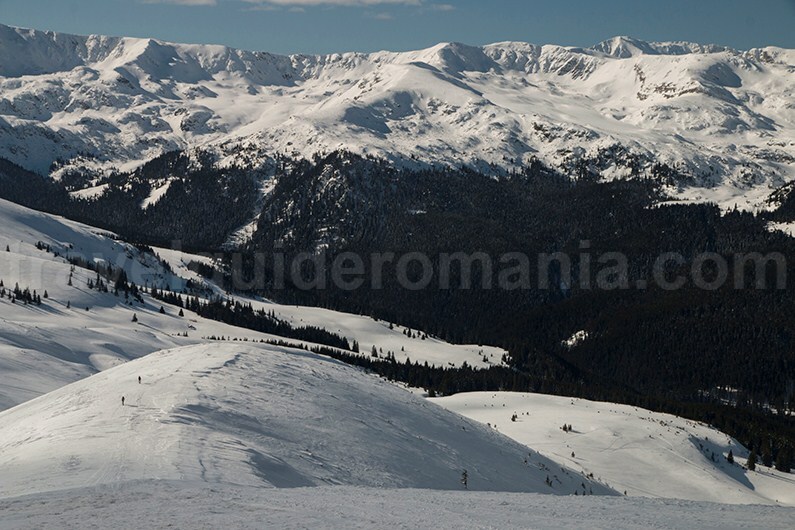 Set off from Vidra-Transalpina Ski Area, situated in Latoritei Mountains (subunit of Parang Mountains). In order to save energy, ascend on the chair lift until you reach the upper part of the ski area, +450 m elevation gain. 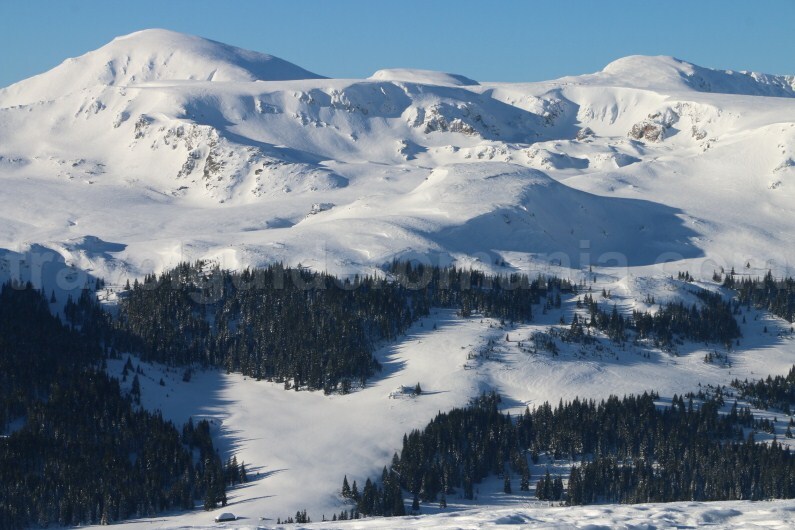 The route passes by the reservoir of the ski area and continues towards Stefan Peak, from where you descend to Transalpina road. 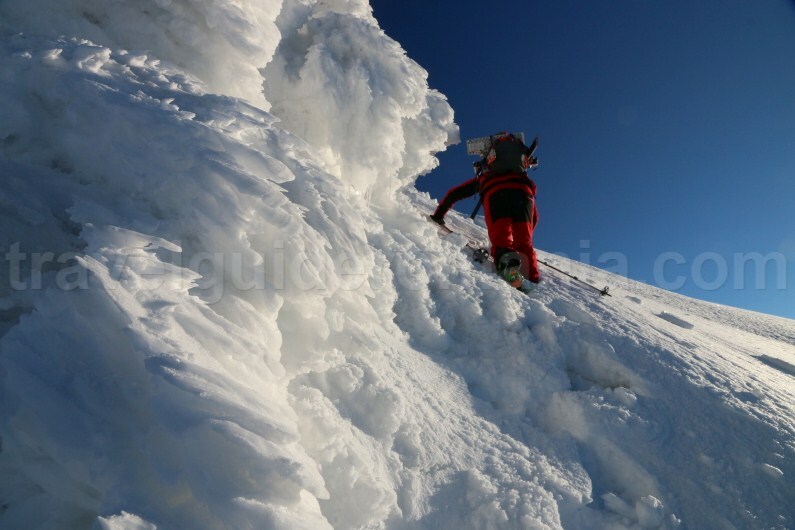 Keep going until you reach Iezer Peak area, bordering the main ridge of the Parang Mountains. Up to this point, covering was mostly done on skis. 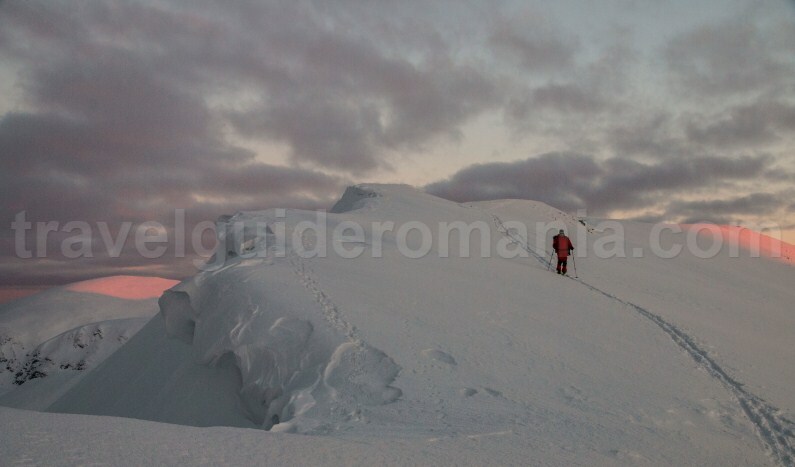 From here the ridge becomes rougher and the elevation level is significantly higher. 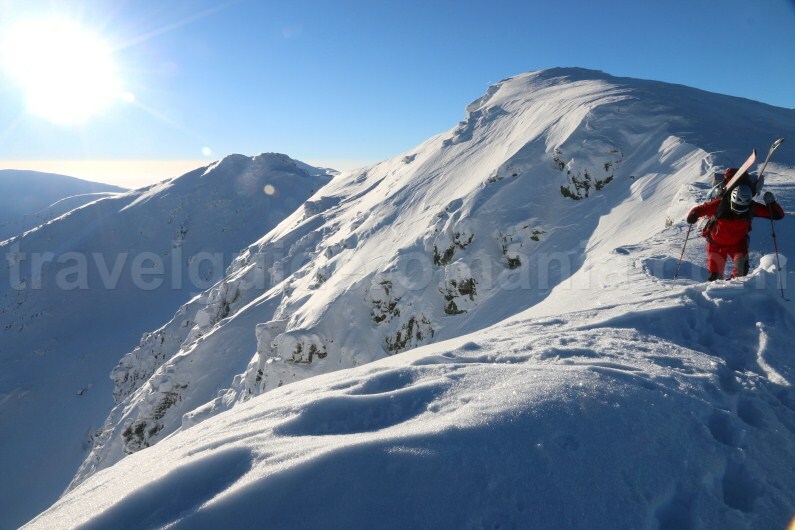 Iezer Peak is the first elevation gain (+200 m). 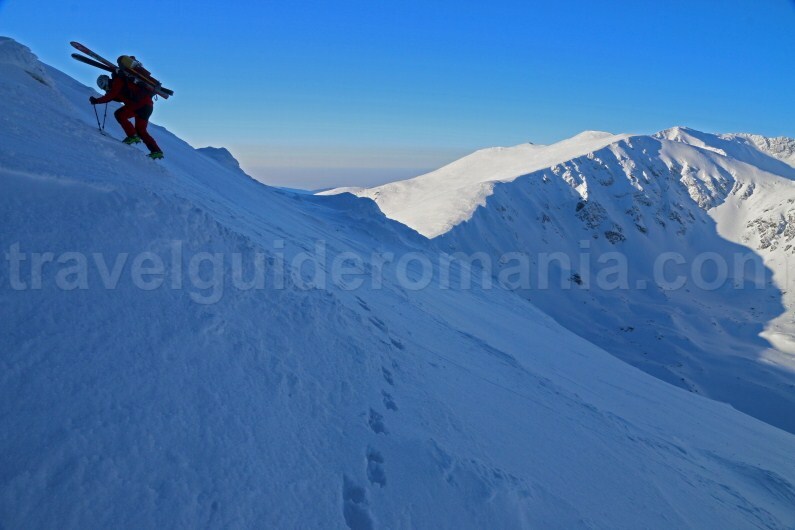 The area of Iezer Peak (2157 m) and Mohorul Peak (2336 m) has steeper slopes that can be covered only with ice picks and snowshoe crampons. 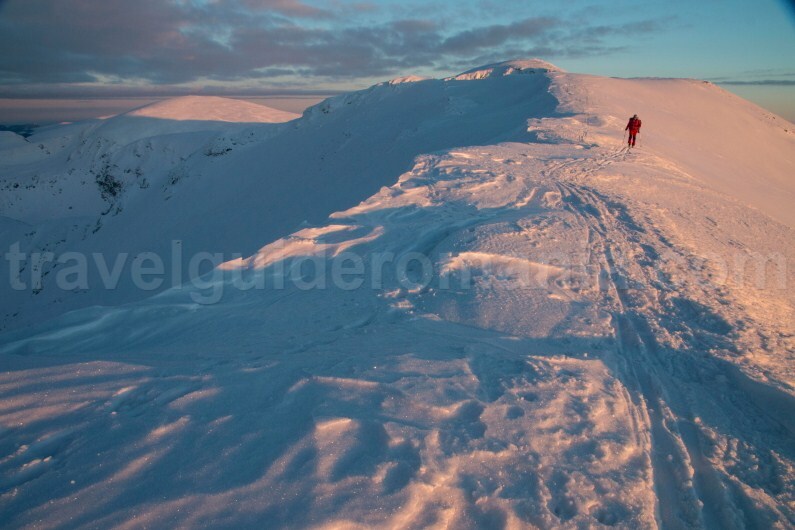 When we have done the route, the snow was hard enough so that we could use our skis. The summer route detours these peaks. 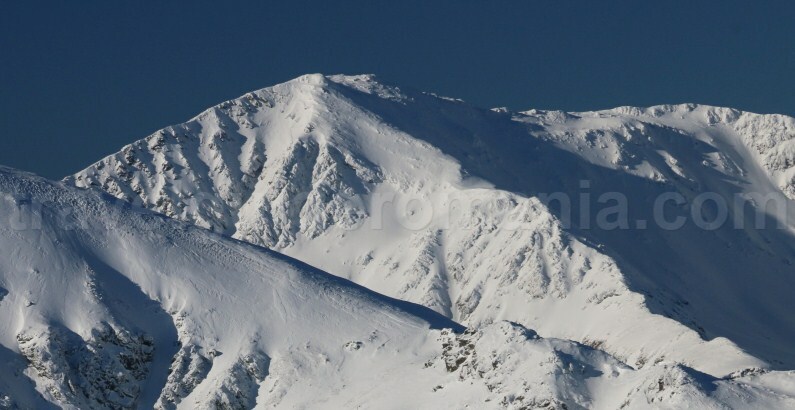 During winter, because of the risk of avalanches, you will have to cover the ridge mathematically. If you have a GPS track, don’t follow it completely, but guide yourselves as you are there. 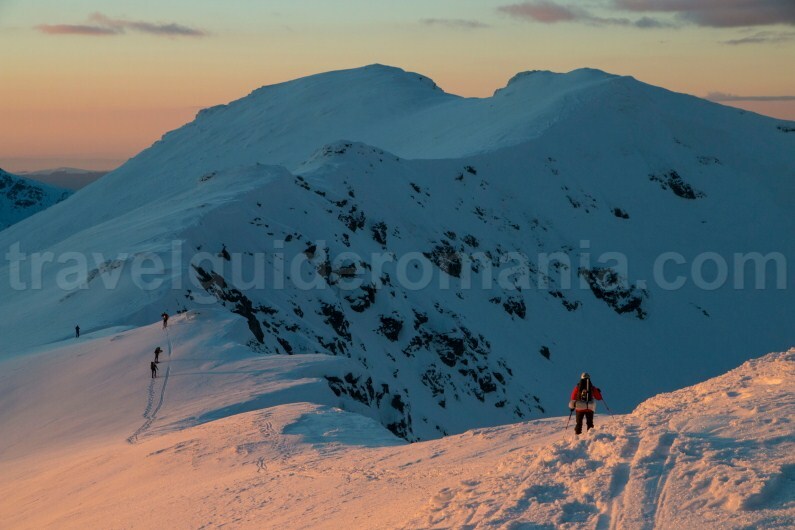 From Plescoaia Peak (2250 m) to Setea Mare Peak (2365 m) and Setea Mica Peak (2278 m) the ridge is narrower and the elevation level is lower. You are above Câlcescu Glacier Cauldron. 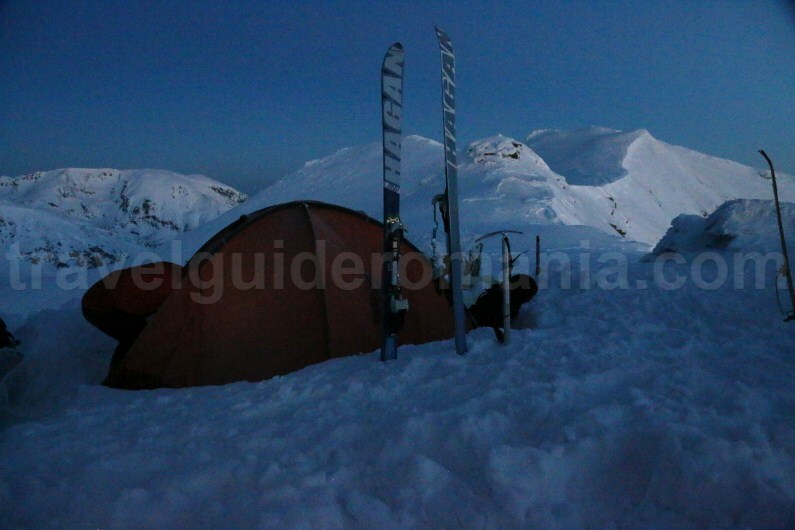 End your day by camping in the Setea Mica Peak area after 15 km and 900 m elevation gain. We recommend making platforms a bit under snow level for your tents. You will have to melt snow in order to drink water and cook some food. Make sure you have the right water intake! 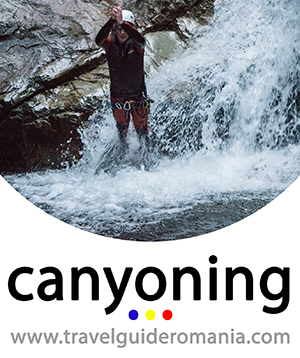 Depending on the number of ski touring participants, technical level, fitness level of the team, weather conditions, and snow, the camping place can the moved. 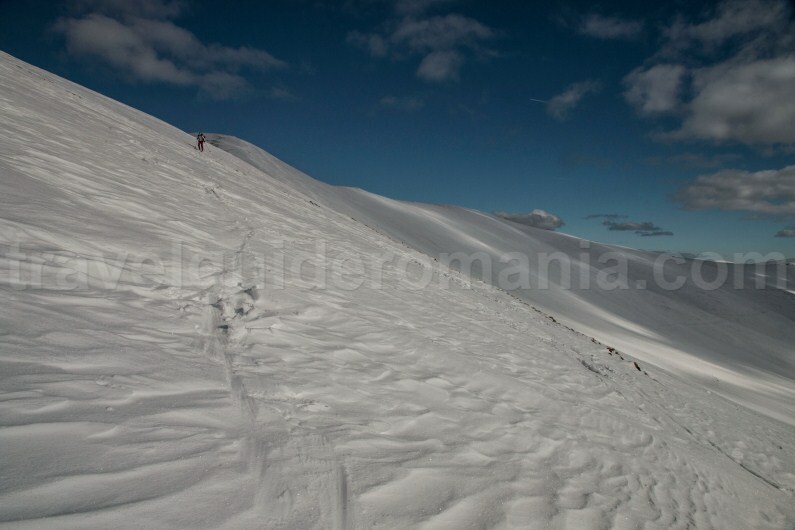 The route covered by us will descend from Piatra Taiata Peak (2299 m) to Coasta lui Rusu Ridge. 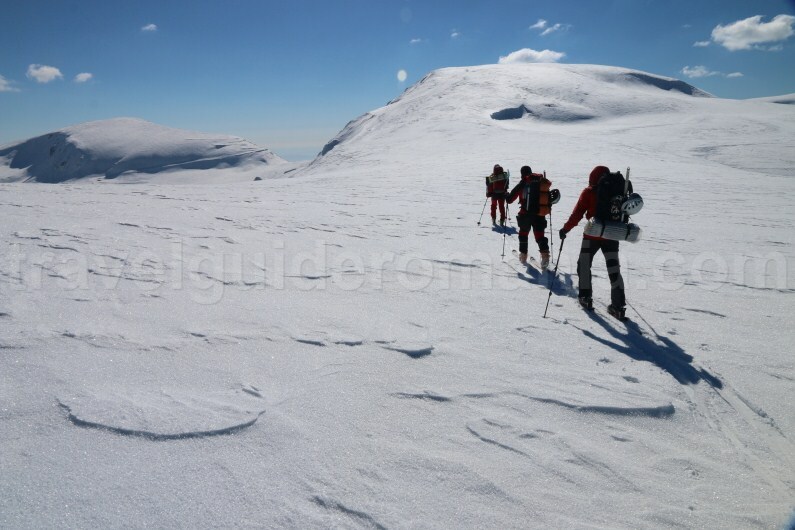 The route can be continued towards Parangul Mare Peak, but you have to take into consideration that the distance till Parangul Mic Peak (where the main ridge ends) means another 15 km and an elevation level of approximately 800 m.
In this situation, you will have to continue almost only on snowshoe crampons and with an ice pick, having your skis on the rucksack until Parangul Mare Peak. You will also have to take into consideration the degree of exhaustion of your team members. 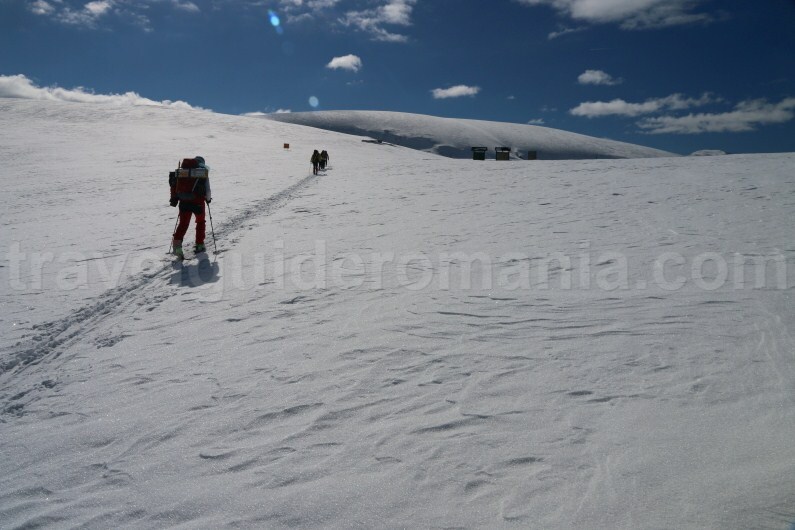 To retreat from the main ridge, Coasta lui Rusu is the best choice in terms of avalanche safety and strenuous activity (you only have to ascend 100m). 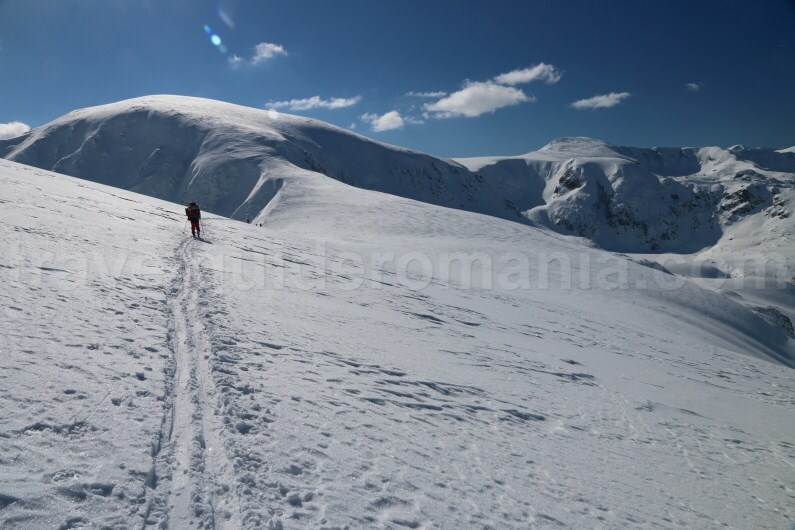 Day 3 – retreat on Coasta lui Rusu ridge till Huluzul Saddle, descent towards Transalpina road. 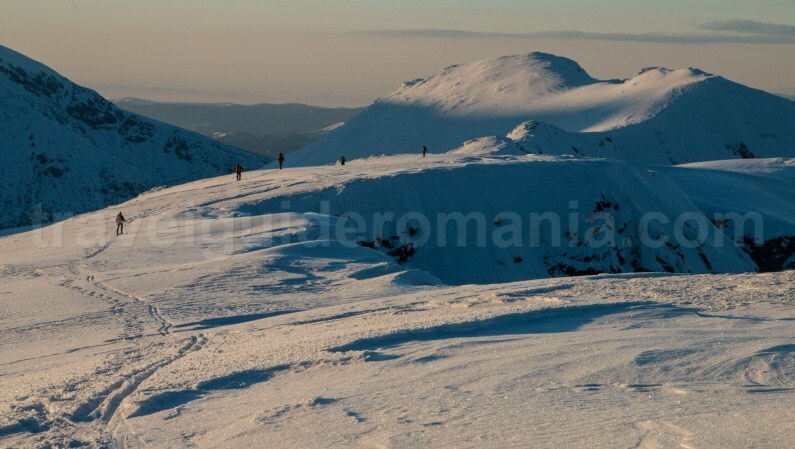 Distance – 12 km; elevation gain +100 m; elevation loss -885 m.
Since you start, from the tent camp you will use your snowshoe crampons and ice pick. 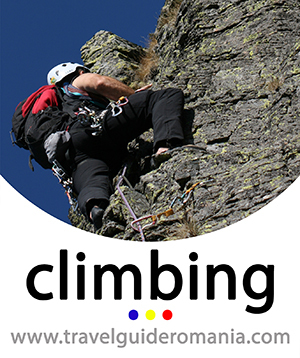 You will ascend Piatra Taiata Peak and continue mathematically on Coasta lui Rusu ridge. It has a pretty small width and for the coverage you will need minimal knowledge on winter mountaineering. 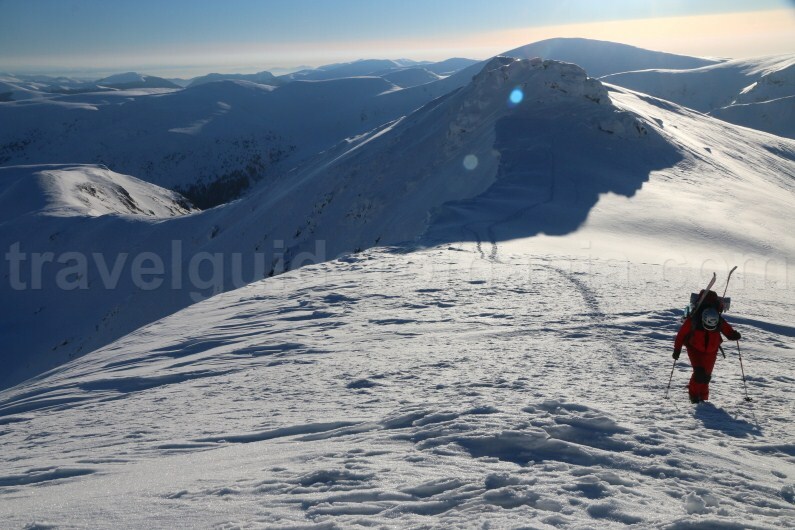 After the technical area you can use your skis until Transalpina road and then DN7A. You can get your cars back from the ski resort by hitchhiking until there.